The past few months have been a busy time for some of the machine manufacturers, with a variety of exciting new launches and updates. 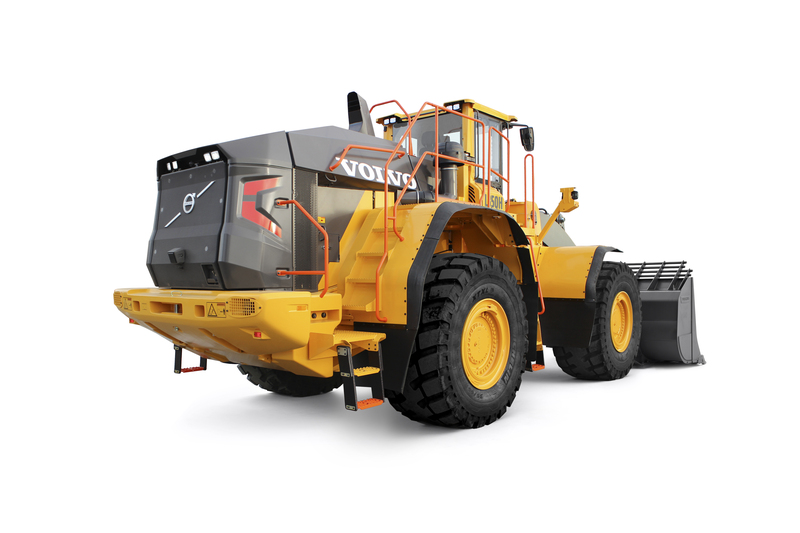 On the loading side, Volvo has launched the L350H, now the largest wheel loader in its range. Other improvements can be found elsewhere on the vehicle. A new hydraulics system has speeded up cycle times by up to 5%, and economy is up to 10% better than the outgoing L350F. The frugality of the Tier 4 Final D16J unit is further enhanced by Volvo’s fully automatic power shift (FAPS) system. And an over-ridable eco-pedal offers resistance to alert the operator when engine speed is higher than necessary. Total net power is 535hp. For maintenance purposes the engine cowling has been redesigned to allow easier access. Externally a new, larger rock bucket comes with a 7.3m3 capacity. At the opposite end of the machine the bodywork has greater clearance away from the tyres to allow easier fitting of chains. The cabin is accessed with a remote door opener on the rear left cab post. LED lights are fitted around the entrance for safer night time use, and further LEDs and reflective stickers that follow the machine’s outlines help to increase night time visibility. The side mirrors are new, and additionally there are optional rear-view cameras if required. An automatic climate control (ACC) system is fitted as standard. Volvo has also updated the L260H, the next machine down in size from the L350F. Two new buckets have been introduced, the Volvo Rock bucket and Volvo Rehandling bucket, both specifically designed for this model, giving up to a 15% increase in payload. Unlike previous designs instead of using a hydraulic pump to lower the boom, it moves down under its own weight, aiding efficiency. An optional boom suspension system (BBS) is also available, enhancing productivity by up to 20%, and reducing spillage when traversing rough ground. To further enhance stability the lift arm has been redesigned and the wheelbase extended by 50mm. Power comes courtesy of Volvo’s Stage IV/Tier 4 Final-compliant D13J engine, rated at 416hp. JCB is launching a proximity braking system (PBS) for its wheel loader range. The first machine to benefit will be the 19 tonne 457. The system works with triple antennas scanning a pre-set exclusion zone around the machine for activity, and should a person enter this area an alarm sounds in the cab, the vehicle automatically selects neutral and the parking brake is applied. For the straying person on foot, a transponder in their safety helmet can cause a vibration to alert them to the danger. The close call is recorded with time and date information to see if there are any ways of improving site safety. The system, which was developed with FCC Environment, will be rolled out across the whole range this year. In other safety news, JCB’s side impact protection system (SIPS), which is standard on the heavy-duty XD demolition specification machines, can now be ordered as an option on all models. 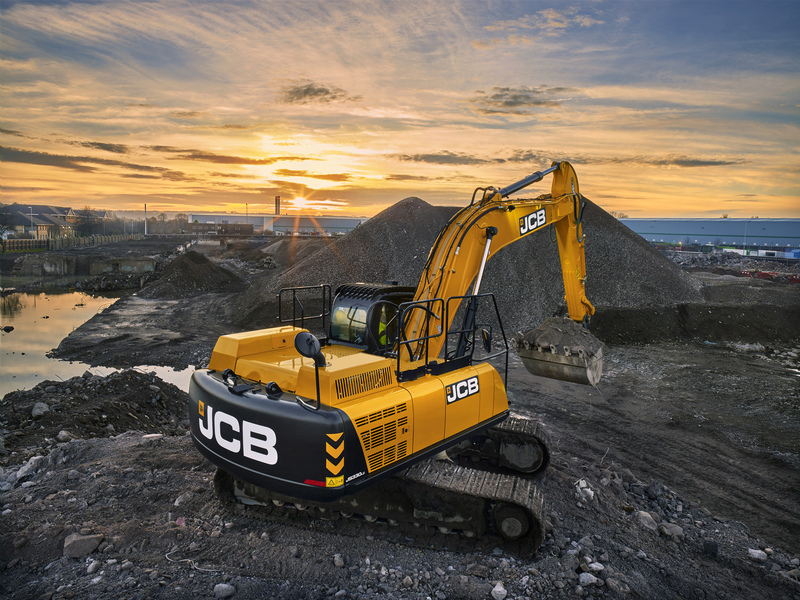 Meanwhile JCB is extending the use of the six-cylinder MTU 6R1000 engine to the JS300, JS330 and JS370 models. The 7.7-litre unit is tuned to deliver 241hp in the JS300 and 281hp for the JS330 and JS370 models. This system allows the engine to meet Tier 4 Final without having to use a diesel particulate filter (DPF) by relying on selective catalytic reduction (SCR). The new engine uses two fuel filters instead of three, reducing service costs, and a new ultra-web nanofibre air filter improves flow. Caterpillar is set to launch a new articulated hauler called the 745. 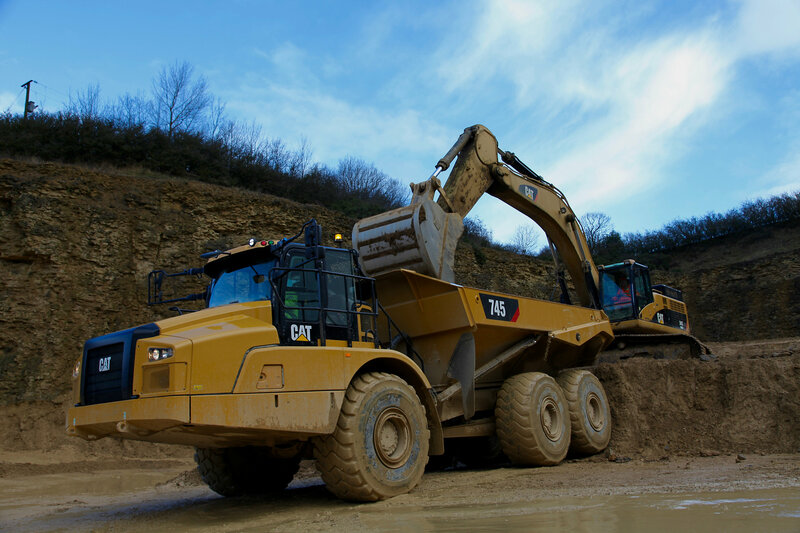 Powered by a 504hp Cat C18 Acert engine, the 41 tonne capacity machine features a completely redesigned cab and a host of other improvements over the outgoing 745C. For operator comfort, new lighter doors offer improved sealing, and now the cab has opening windows on both sides. Noise inside is reduced by 5dB. Different glass reduces the heat levels, while more vents help with air flow. A new heated/cooled seat enables more adjustment than the previous offering. Also new is a ‘wake up’ feature that is activated when the door is opened, starting the displays ready for when the operator is settled. New mirrors and payload area lights improve visibility, as does the removal of the rear structural pillar, replaced by bonded glass. For controlling the machine, a new combined transmission and hoist lever reduces operator effort, while a revised push-button lever control allows the operator to easily set the machine speed and select transmission hold/waiting break. 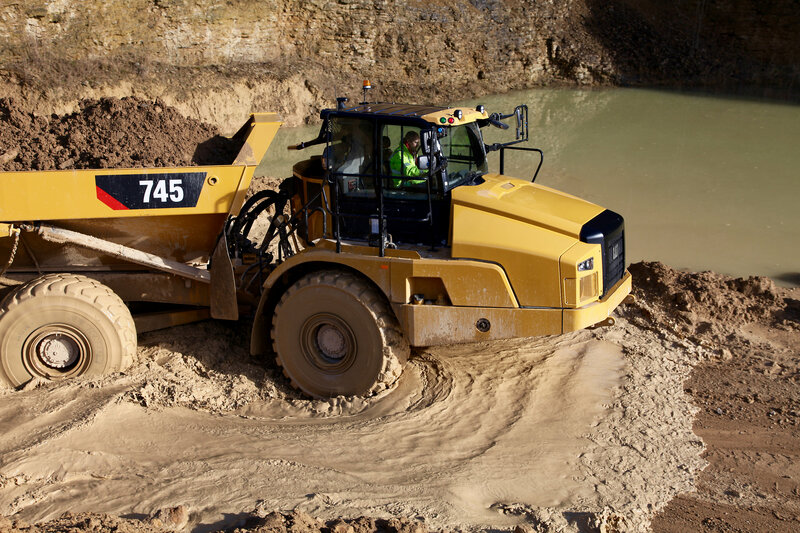 Several safety features come as standard, including directional gear changing protection, ensuring the machine is fully stationary when changing gears, and the new Cat Detect with Stability Assist system, which has an audio visual warning if a dangerous payload angle has been reached. A pro-active diff lock system reduces wheel spin over rough ground, and terrain-based throttle smoothing prevents the truck from surging when the driver is being shaken about and can’t keep even pressure on the throttle pedal. 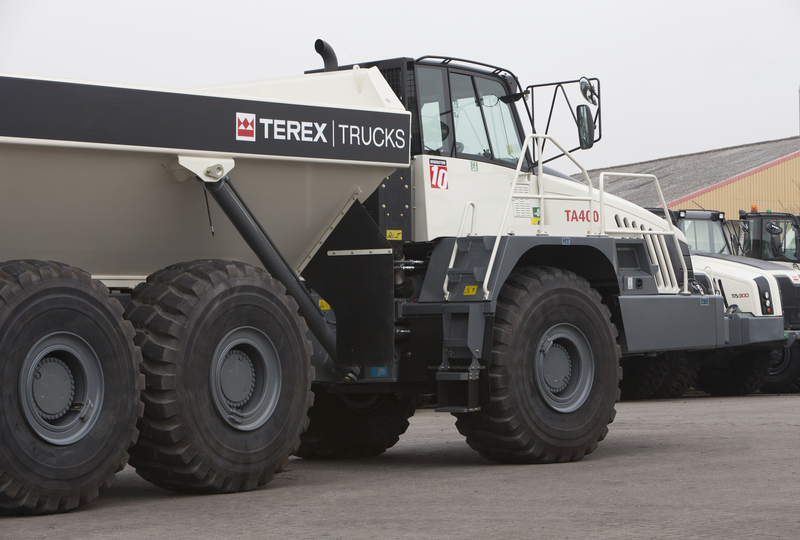 Terex Trucks is launching a new extended two year/6,000 hour warranty on all factory-approved parts. Gary Bradburn, aftermarket commercial manager explains, “There are risks to safety and consequential damage to machines if just one cut-rate alternative part is fitted as anything can happen. Buying non-genuine parts is a case of ‘good price, good luck’ – we ask that customers look beyond the initial price of such products as it’s more than likely that additional service costs will arise in the long-term due to damage downstream. 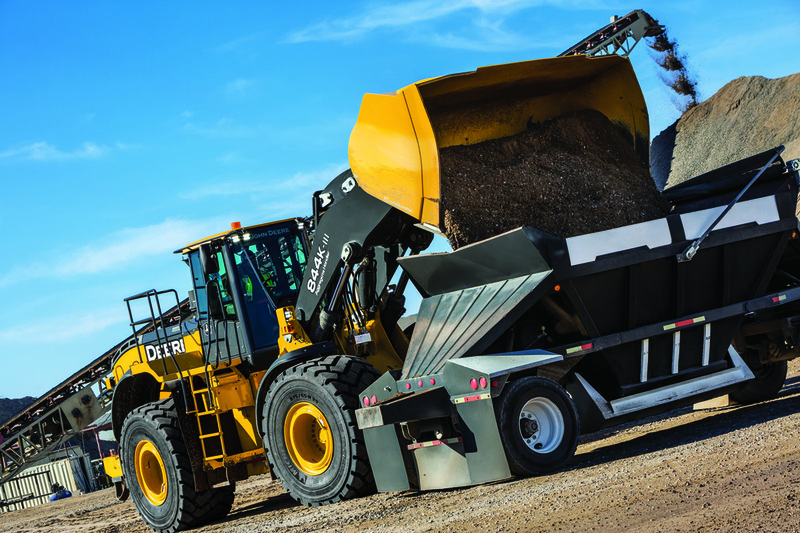 John Deere’s wheel loader family has grown. The 844K Series 111 comes in standard or Aggregate Handler configuration, with the 13.5 litre John Deere PowerTech engine tuned at 380hp or 401hp respectively. Both have a five-speed transmission with torque-converter lockup in all gears except first. Various other upgrades are dotted around the machine, such as additional bulkheads and improved hoses, with some 81 feet of hoses being replaced by more than three dozen steel tubes. 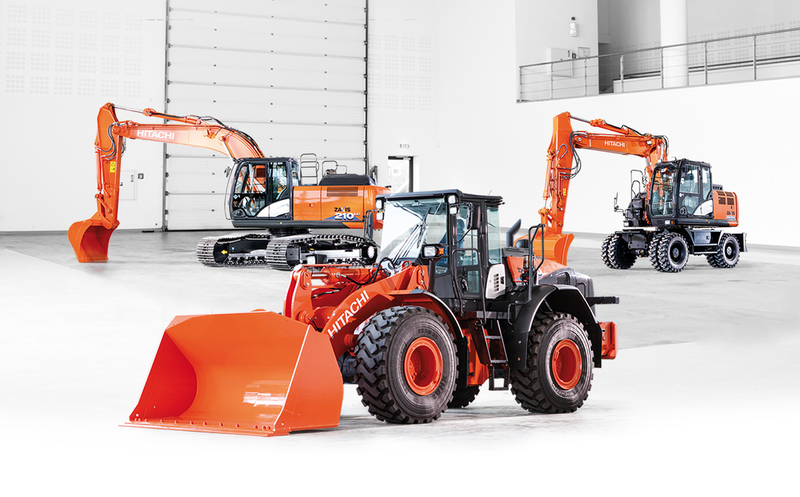 Hitachi Construction Machinery (HCME) has introduced a series of new models designed for the European market. There are four new Zaxis-6 wheeled excavators, with new Stage IV technology engines, as well as the ZW-6 wheel loader, five new medium excavators, from the ZX130-6 to the ZX210LC-6, and two new large excavators, the ZX690LCH-6 and ZX890LCH-6.